Junior Surf is divided into age groups (ages calculated as of Oct 1). Some groups are further divided into squads according to age or ability. At A Group level, the children will be introduced to competing at club and inter-club competitions and will receive a solid grounding in beach flags, beach sprints, relays, run-wade-run, and boogie board race. They are also introduced to the techniques of surf life saving. Competent swimmers (those who earn the 200m patch) will be introduced to surf swimming, and board racing, and board rescue events. 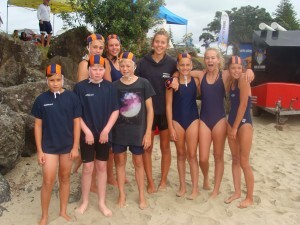 Swimming ability required: Children are expected to develop their swimming skills at A Group level. 7 and 8 year olds can still participate and compete in most events without any developed swimming ability.9 year olds will need to attain a 200m patch to be able to compete in water events (surf swimming, board race, and board rescue). B Group training builds on the events taught at A Group level and introduces more demanding events such as Diamond person and tube rescue. The emphasis shifts more towards the water events at this stage hence it is important that members have developed their swimming toward attaining their 200m patch. Lifeguard training occurs on a regular basis. Swimming ability required: B Groupers are expected to be able to attain their 200m patch at the start of the season. At C Group level, training becomes more intensive with a focus primarily towards developing life saving skills but also providing an environment for becoming actively involved in SurfSports. C Groupers can participate in some of the bigger competitions and have the opportunity to be selected for the U14 Development Squad and/or Rookie Lifeguard program. Swimming ability required: C Groupers should be able to complete their 200m patch with ease. PUNCTUALITY IS IMPORTANT! PLEASE ensure children arrive on time. Due to current OSH management requirements, latecomers MUST report to team managers BEFORE joining the training session. Children must have their uniform, a towel, change of clothes, plenty to drink, and be wearing sunblock. For safety reasons, skull caps are compulsory for everyone NO SKULL CAP – NO WATER ACTIVITIES – NO EXCEPTIONS. PLEASE wash down all gear and put it away in the gear shed. Training starts regardless of weather, unless otherwise advised. Training usually finishes at 12:00pm for A, B, & C Group. Parents and junior members must attend roll call and squad meetings at the start of training to receive important information via notices and newsletters. At the end of training, there is usually a BBQ and drinks for sale and other fundraising activities for the Junior Surf program.